In case you haven't heard, 26-year-old American rapper, singer, and music producer, Malcolm James McCormick, more popularly known as Mac Miller, tragically faced death on the 7th of September 2018 due to apparent drug overdose. He was found unresponsive and declared dead upon arrival of authorities in his Studio City home. Mac Miller was in a long term relationship with pop star Ariana Grande as they dated from August 2016 to May 2018. Ariana shared a heartfelt photo of Mac Miller after the announcement of his passing. But as with Ariana's abrupt engagement to comedian Pete Davidson also in 2018 shortly after her and Mac Miller broke up, the public was quick to comment on Ariana being the reason for Mac Miller's death, attacking the singer on social media. So much bad and hurtful words have been thrown towards Ariana that friends, fans, and even not fans started to back her up on social media to support her. Sure enough, no truer words have been spoken - it is triggering as hell that people's first judgment upon knowing hearing the news was to head to social media and blame Ariana for Mac Miller's death instead of the typical human response of giving condolences to an artist who influenced their lives. Particularly, it was troublesome that people kept referring to Mac as "Ariana's ex-boyfriend" as opposed to simply referring to him as his own person. Mac may be relatively new to the industry but he was quick to reach success and make a name for himself as well. More than this, it was quite bothering how people blamed how Ariana was quick to move on from her relationship with Mac when the relationship they had, as reported, ended up being toxic and unhealthy. 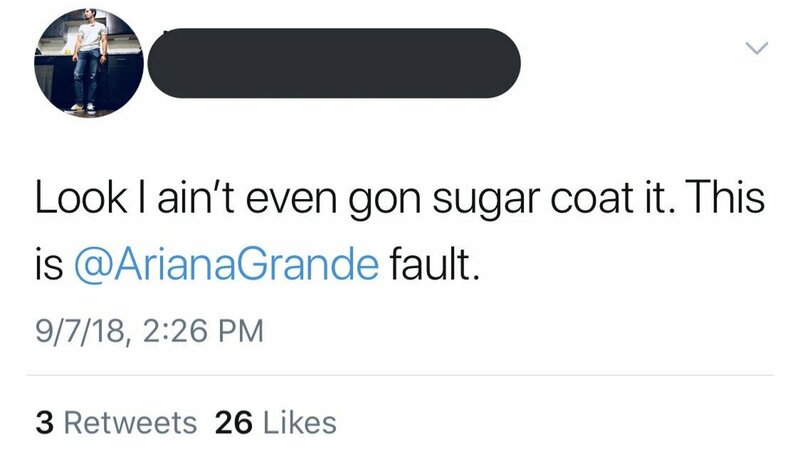 True enough, it was never Ariana's fault as to how and why Mac passed away. It was his choice and his life to live. However, the news about this triggered people because it resurfaced an issue less discussed about how women's purpose and positions in relationships are viewed by some people in society. More often than not, women are stigmatized and expected to stick around toxic relationships and endure the stress to make it work. In fact, this shows on a lot of articles and stories online. As if women are not allowed to leave unhealthy relationships. We believe that all people deserve to be happy and it is not fair to blame the actions of one to the reaction of another especially if we don't have the slightest idea as to what the whole story is. Instagram user @sophia_nickole summarized it so well. However the case may be, no one truly knows the full blown story. Perhaps aside from what we learned from above, another lesson is not to meddle with other people's personal lives. Mar 19 Catriona Gray Wins the Miss Universe Philippines 2018 Crown and We're Not Surprised!